Kenya, Tanganyika and Uganda were once British colonies. At that time one stamp bore the name of all these three colonies on one stamp, Kenya and Uganda on the top and Tanganyika in the bottom. No one for sure knows the why of such arrangement, but this how the stamps of these three colonies fro as long they remained under the British control. The cumulative stamp serving needs of these three colonies started in 1935 and continued till 1963, when these colonies start to get independent to shed away the yoke of slavery they collared for all these years. The last stamp in the first column from the right is the oldest that I have. it bears the head of King George V and this stamp dates back to a period between 1935-38, thus making it almost 75 years older. In 1938 after King George VI became the new king of the Great Britain, his head started to appear on these stamps as can bee seen in the first two columns from the left. The stamps in the first column depicts the famous Lake Naivasha in the background. The stamps in those days generally bore the portrait of King George with Lake Naivasha in the background. Part of the Great Rift Valley, Lake Naivasha is a freshwater lake in Kenya, lying north west of Nairobi, outside the town of Naivasha. The stamps in the rest of the three columns ear the head of Queen Elizabeth II are of the period after her coronation, especially 1959. These stamps continued till the three courtiers became independent in 1963. Tanganyika on independence split in to today's Rwanda, Burundi, and Tanzania. The two bigger colonies of Kenya and Uganda remained their entity intact and continue to be so till date. Even after the independence, these stamps continued to be in use with the name of the country appearing as an overprint. 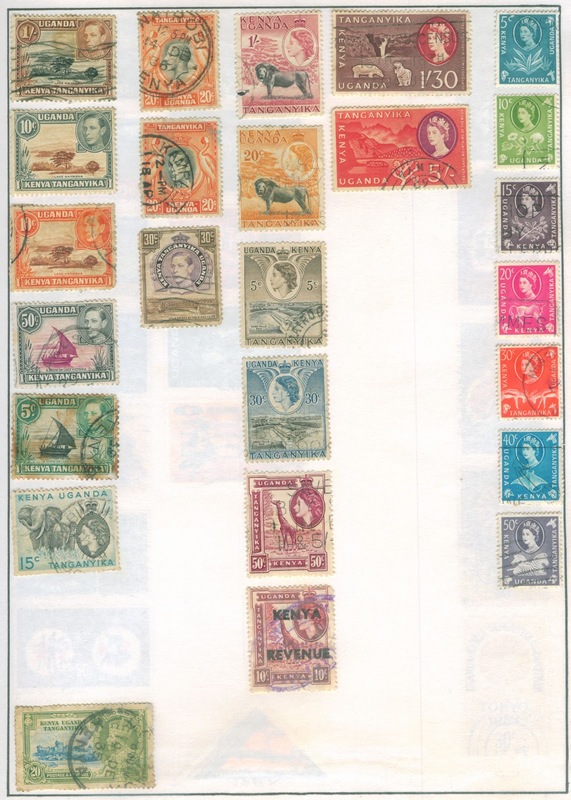 The last stamp in the third columns from the left shows the earlier combined stamp used by Kenya with "KENYA" overprint. Since the same stamp was used for the revenue purpose, the word "REVENUE" also appears as an overprint.